If you’re giving your dog a bath with whatever shampoo you could find at your local big box store, it’s time to stop, right now. Those shampoos may be priced at the perfect “$4 per bottle” but what you don’t know is that they’re loaded down with harsh chemicals. The harsh chemicals that may get your dog clean, but could also be causing long term problems like skin irritations and allergic reactions. Instead of putting your dog at risk with a bunch of man-made ingredients, there’s a new, affordable solution for you. The Earthbath All Natural line of dog shampoos. 100% All Natural, BioDegradable Formula: There are zero harsh chemicals inside of each bottle of Earthbath. Every formula uses proven, 100% natural compounds to not only clean your pet, but help relieve other ailments that they may be suffering from, too. Soap Free Shampoo: There are no soaps, or soap compounds in any of the Earthbath line of products. These harsh soaps may work great for cleaning your pet, but they also work great at stripping your pet’s natural oils, leaving them vulnerable to other problems. Naturally Scented: Along with being completely void of ingredients that could potentially harm your pet, every bottle of Earthbath also uses natural scents that you can find in the great outdoors. These scents smell great, but pull double duty with their innate properties that promote healing, combat skin irritations, and re-moisturize your dog’s dry skin. Highly Effective, Groomer Trusted: Groomers around the world put their trust into the Earthbath line of products because they’re consistent, affordable, work great, and smell even better. This isn’t some run-of-the-mill company putting out as many products as they can to increase profits. 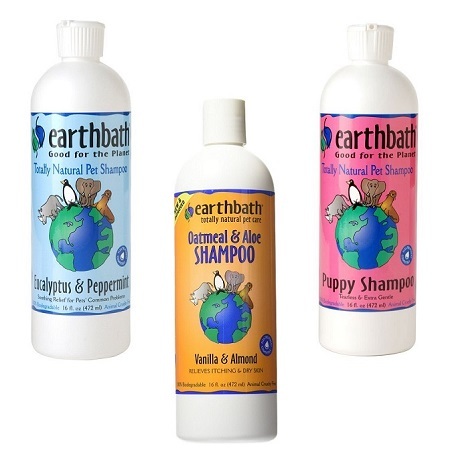 Earthbath’s only line of products are their all natural shampoos. Combats Skin Irritation & Re-moisturizes Dry Skin: A lot of shampoos will strip your dog’s natural oils. The ingredients in each bottle of Earthbath, though, actually help spread their natural oils out, while also tapping into nature’s ability to help your pet maintain a healthy coat. 12 Different Formulas: The Oatmeal formula may be their best selling, but it’s not their only formula. In fact, there are 12 different scents and formulations so you can have a bit of variety in your dog’s bath time. Some Formulas Are Low On Scent: For instance, their “Orange” formula doesn’t exactly smell like oranges, but works just as well at cleaning your dog and leaving them feeling fresh. If you really want an orange scent, plan on adding in some natural orange oils. From oatmeal, to eucalyptus, mango, orange, green tea, and aloe, there is a formula for every situation your dog may encounter. Coat producing too many oils? Use the orange or mango to strip just the right amount, while leaving behind a healthy coat. Skin irritations? Use the mint and aloe formula to clear them right up. The Earthbath line of dog shampoos are 100% all natural, and trusted by groomers for good reasons. Don’t just take our word for it, though. Click on the button below to see what other customers are saying about them. They have hundreds of raving reviews!